If there is one thing I love about gatherings of friends and family, it's when the board games come out! There is just something about the drunken antics of adults trying to win or cheat that gets me every time! I know what your thinking- such a hassle to get everything out, read the instructions and get things going but trust me, once you do it's such a reward- instant party gold! I was invited by Mattel to host a games night. They provided me with a fabulous box of goodies for my games night; games, napkins, coasters, bottle openers and even game themed fortune cookies! APPLE TO APPLES- To be a great party game it has to fill some criteria. It has to be fun, easy and everyone has to feel like they are part of it- this has it all! Simple to play and I loved that extra bit of controversy as everyone gets a chance to be the judge of who has the best card- obviously everyone thinks they have the best card and this is where the fun begins! A perfect party game! 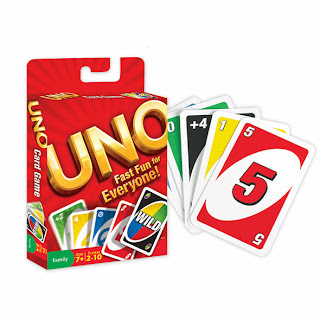 It's as easy as “comparing apples to apples”... just open the box, deal the cards, and you're ready to play! 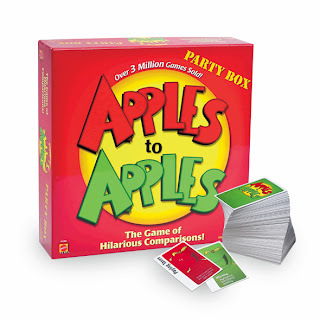 Fast moving and refreshing, APPLES to APPLES® is perfect for any get together with family and friends! The Party Box comes complete with over 1,000 cards. MAD GAB- Honestly, we had very little success with this game. Its easy to understand the rules but saying the strange phrases in the hope that others will guess what you are saying is actually very difficult. It was hard to get the game to flow as we spent more time looking at each other confused. Now three out of the four guest at the party are from the UK and we discovered, by chance, that if one of the players uses a very dodgy Geordie (Google Ant and Dec if you don't know what this sounds like) it was then far easier to understand the phrases- needless to say this didn't help us play the game, but it did make us all giggle! 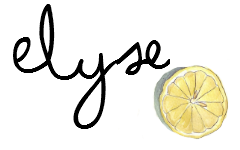 It's not what you SAY, it's what you HEAR!® Try this: DEW WINO HUE. Repeat the words a few times aloud, and you're sure to guess that you are actually saying "Do I know you?" 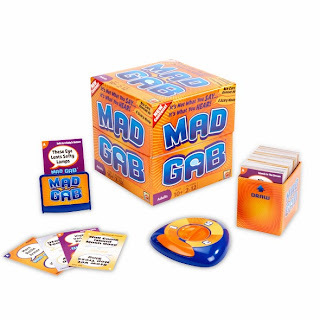 In Mad Gab®, teams work to decipher groups of unrelated words into real phrases before time runs out. ANGRY BIRDS SPACE- I cannot give a review of this game. Why not you ask? I didn't get to play it! The kids saw it in the box and instantly ran off with it. Well that's no bad thing- they had a great time with it. I am not sure they actually played the game as the rules stated but they had fun building it and knocking it down so it was a win in this house. 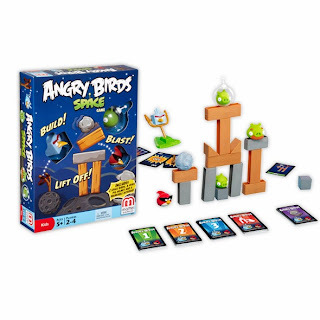 Build, blast and lift off with an exciting skill-and-action game based on the best-selling digital app Angry Birds™ in Space. The egg-stealing pigs are out of this world, and the Angry Birds™ have followed to get their revenge! SKIP-BO- We didn't get round to playing this game at the games night- we had way too much fun with Apples to Apples and Uno and ran out of time! So hubby and I played it one evening. It's a fast paced, easy game. It's one of those games that you can't play for long as it requires some serious concentration levels to keep your eyes looking for the right dice- maybe lots of wine will help with this at a party! I plan to take this with us on a long plane ride as I think it will be a good distraction game for kids and grown ups! 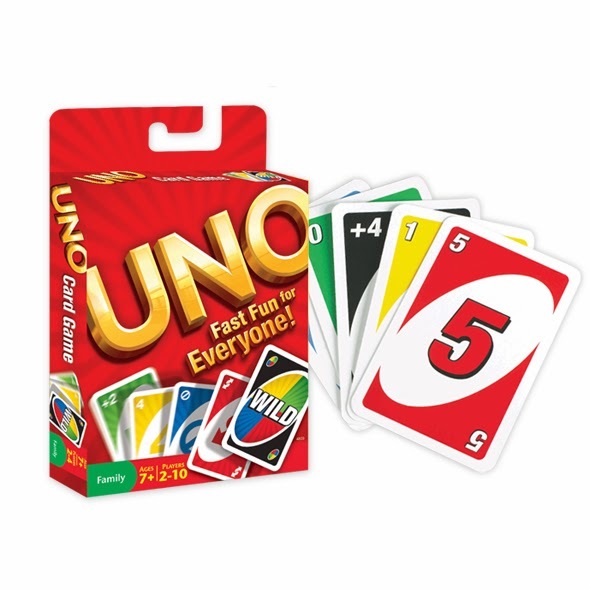 Skip-Bo® meets speed in this fast, fun, different way to play! 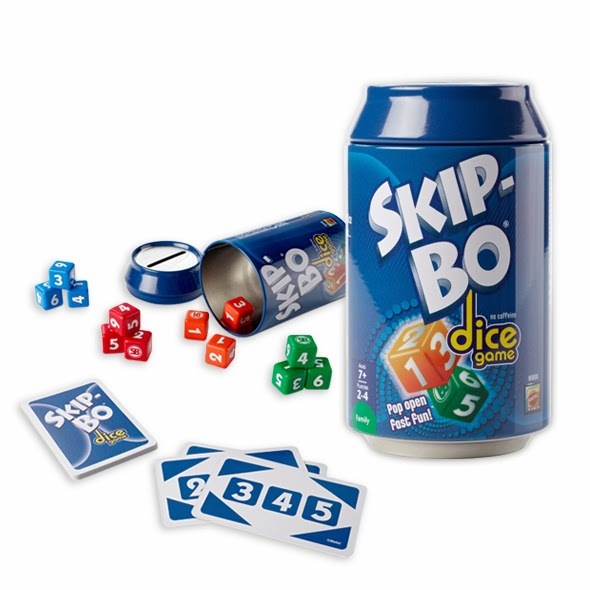 Quickly roll and re-roll the Skip-Bo® Dice to match the Skip-Bo® Mission Cards. Be the first to collect five cards to win the game! So all in all it was a pleasure to host this games night for Mattel. Having never played most of the games before we were up and running in a few minutes with each one. So if you are looking for ways to make your festive parties sparkle make sure there is plenty of wine and a few board games! The Life Without Lemons household recommends Apples to Apples! Happy playing and no cheating!! Looking forward to playing apples to apples with you soon ...... We played it with Nan & Grandad !!!!!!!!!!!!!! !